Where vinyl, plastic and paper were once the primary substrates of choice for signage, textiles are taking center stage. There are many reasons why the soft signage sector of the printing industry is exploding. Digitally printed textiles make products richer, more luxurious, eye-catching visual solutions than paper, plastic or vinyl substrates. In addition, textiles are not as subject to curling and discoloration as the paper and vinyl counterparts. Textiles can create a more sophisticated look for the image conscious retailer. 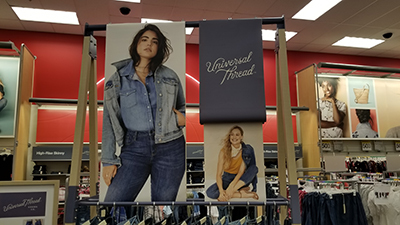 Soft signage provides a medium for artistic creativity and beautiful visual graphics designed to reinforce brand loyalty and enhance the customer’s shopping experience. One of the appeals of soft signage is the natural drape of the fabric. Fabric has an overall softer look and feel, and it can be effortlessly draped around curves. Rigid materials do not offer this flexibility, and they can be difficult to handle and ship. Digitally printed soft signage is very lightweight and can be folded or rolled without being damaged. Ask the Aurora Sales person in your area what is the best printable textile for your display. Check out the different fabrics and canvases that Aurora Specialty Textiles provides to design a memorable retail shopping experience. What is Tape Backing, and How is it Related to the Manufacturing of Pressure-Sensitive Tape? As a tape manufacturer, many might already know what pressure-sensitive tape backing means. This term can be thrown around and not necessarily mean the same thing to everyone. To better understand what tape backing is, picture a strip of medical tape. One side of the tape has the white cloth, and when you flip it over the other side has the adhesive part that will stick to your skin. The cloth side is the cloth tape backing. When considering a piece of medical tape, that cloth tape backing is a vital part of the product. Without it you would have nothing for the adhesive to hold on to, nothing to protect the adhesive and nothing to give stability to the tape. Tape backing can be produced by a multitude of different manufacturers in diverse ways. Some facilities bleach, coat, and apply the adhesive to their tape backings in house. Others purchase the cloth tape backing and apply their adhesives to it. Cloth tape backing can make or break the usefulness of the product. Depending on the cloth tape backing, the adhesive may not apply properly, or the tape may not be able to tear like it should. These qualities are imperative to the performance of the product. Therefore, it is so crucial for individuals who manufacture tape to understand what the tape backing is, and how it plays a roll in the products they will be selling. A manufacturer can have the best adhesive to put on the tape backing, but if the tape backing itself is not up to par, the product will never perform as it should. When considering a tape backing manufacturer make sure you ask questions and confirm you mean the same thing by the term tape backing. Check out the different cloth tape backings that Aurora Specialty Textiles offers. Designing and applying the proper fabric finish or coating are critical to the performance of your product in the end use application. Different coatings and finishes, and the application method affect the performance of the end use application. This is clearly an area where one size, or one coating, will not work for every project. As the industry has differentiated, fabric coatings and finishes have become more specialized to assure optimal performance. Optical brighteners: A bright white product is critical for the aesthetic and consumer acceptance of many products, but there are different shades of white. Optical brighteners can be used to enhance the brightness and give a cool blue white. Calendering: Can be used to reduce pinholes of open fabric. It can also be used to modify to the smoothness, gloss and thickness of textiles. Fire Retardants (FR): There are a wide range of FR certifications and requirements depending on the end use application. The FR can change the hand of the fabric and might make it stiffer. Make sure you have the proper treatment to meet the certification and fabric properties needed for your application. Water and Stain Repellents: These are often required for textiles used in home décor, such as wall coverings or furniture. Water repellents are also needed for outdoor protective coverings, such as tent displays or boat covers. Anti-mildew and Antimicrobial: Outdoor applications often require anti-mildew treatments. Antimicrobials are applied to hospital textiles to reduce transmission of hospital acquired infections. Hand Modifiers: Different types of chemistry can be used to soften or stiffen a fabric. Acrylic, PVC and Urethane Coatings: Acrylics are a good value and a great coating for printable textile canvas products, such as Aurora’s Expressions line of coated printable textiles. PVC is used for gaffers’ tape backing. PVC leaves a very soft hand and matte finish. Urethanes offer a very durable coating for high abrasion applications. Perhaps this is stating the obvious, but a great deal of science is involved in the development of new coatings and the refinement of coating and finishing processes to meet the evolving textile industry needs. It’s important to be aware of the many variations of coatings and finishes, and work with industry partners who can guide you in the right direction based on the end-product and the technologies you plan to use. Contact Aurora Specialty Textiles and learn more about the types of coatings and finishes they can provide.